The nest generation Echo 58V Cordless Blower gets major upgrades in design and performance, but there is still some room for improvement in fit and finish. Echo’s first foray into the cordless OPE world wasn’t bad, but its blower was kind of like the weird kid in the group with a strange design and okay performance. The Echo 58V Cordless Blower Version 2 gets a much sleeker jet fan design and a performance boost. It’s maturing and is beginning to look like it belongs a little more than before. Looking the part is one thing and performance boosts are always welcome, but does that mean it can compete with the top brands on the market? The old model had a brushless motor as well, so this isn’t a big change. Still, you want a brushless motor in any lithium-ion OPE if you’re going to jump into the battery platform. Jet fan designs are the new buzzword in blowers, but there’s a reason jets use them – it’s an efficient design to pull air through the motor and blast it out the other side. By using this inline design, Echo eliminates air friction and twist that side intake (like the DeWalt FlexVolt) have to contend with. The battery now goes in the back and has a much better balance. It also gives the blower a longer reach so you can get closer to stubborn material without bending over or holding it at angles nearing 90 degrees. While balance is there, I’d like to have some overmold on the handle. As it stands, there’s just some texture on the bottom of the plastic grip. There’s a mechanical cruise control switch like we see in the earlier model. It only has a couple of positions, but that’s all most people need. It’s a little stubborn to move from one position to the another though. In the end, I just stick with the variable speed trigger. The debris scraper is fairly unusual for the cordless blower class. It’s essentially a metal ring that goes around the nozzle end so when you give stuck debris a nudge, it doesn’t wear down the plastic. It’s nice to have, but not something I use very often. The blower I use on a day to day basis is my Milwaukee M18 Fuel Blower. It’s more of a supplement to gas power than a replacement since we’re not really talking gas power until someone hits 600 CFM and 200 MPH. On paper, the Echo 58V Cordless Blower specs out higher by quite a bit. Even compared to the other blowers we’ve reviewed (and I’ve used all of them), Echo looks pretty good based on spec. In practice, Echo matches up very well in performance in high speed to Milwaukee. However, the turbo button definitely takes it into another league with real power to move debris. Broad leaves are a piece of cake and even the sand covering some pavers outside couldn’t hold on. Like most of the blowers we’ve tested, Echo meets its match when trying to move the oak leaves that pile up in the grass. That’s where getting the air speed up to 200 MPH will begin to reap benefits for this class. When you look at how it compares to other blowers on the market, it looks to be one of the best in the handheld lithium-ion class. EGO’s backpack blower is at the top when it comes to air volume at 600 CFM and their new handheld comes out to 575 CFM. On the air speed side of things, Stihl tops the list at 168 MPH with their BGA 100. However, any of these blowers can get close to 200 MPH by restricting the nozzle to be more narrow. The cost is the air volume when you do that, though. It’s the combination of high numbers for both that gives you overall performance reaching toward gas power. While Echo claims you get over an hour of runtime, that’s in low. Using the kitted 2.0 amp hour battery, there was a clear reduction in power at the 14-minute mark and a complete stop at 14:38. That’s on high. If you really want to run in Turbo, you’ll restrict your runtime even more – down to 6 minutes, 15 seconds. The battery actually showed a little left in the tank, so it was a thermal shutdown that kicked in to protect it during my tests. Pro Tip: To get the most runtime and life out of your battery in a blower, only use turbo when you really need it. The battery will stay cooler and discharge slower, leading to longer life. Getting rid of the gas and moving to battery power almost always comes with a reduction in noise and vibration. 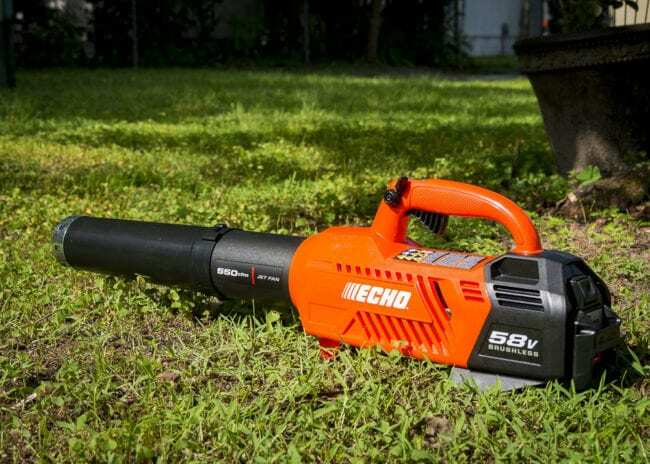 While the overall volume level of the Echo 58V Cordless Blower is less than a gas engine, there is a high pitched whine that really cuts through and makes it seem louder. There’s also a little bit of vibration in play. It’s not much (and its much less than a gas model), but it is noticeable if you use this class of blower a lot. The Echo 58V Cordless Blower makes a strong push as one of the best performing handheld blowers when it comes to air volume and speed. Where it falls short is in the fit and finish. Runtime also suffers somewhat thanks to the 2.0 amp hour battery. What might turn users toward another brand is the high-pitched whine of the motor. While clearing off the driveway won’t take long, blowing the fall leaves will. That kind of extended use will make it more of an irritation. What’s nice is that even with this new design and better performance, the price goes down. The previous model came out at $269 while the updated one drops to $229 at The Home Depot. That puts it at a more competitive price point if you’re considering jumping on the battery platform.